Troops of Operation Whirl Stroke, (OPWS) have announced the killing of three gang members of Terwase Akwaza, also called Gana. 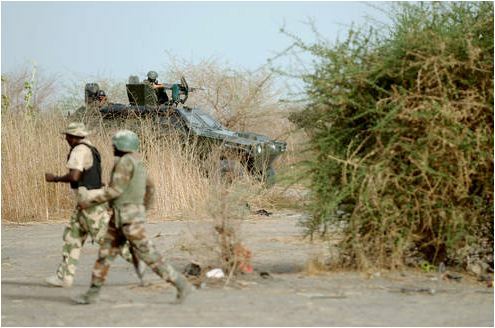 The Theatre Commander of the operation, Major General Adeyemi Yekini disclosed this yesterday. He said the gang attacked some residents of Zaki Biam town in Ukum Local Council Area of Benue State. It was reported that Gana is the gang leader of the militia group that has been terrorising parts of Benue, particularly the Sankera axis. His activities made the police and the state government to declare him wanted, including placing N10million ransom on him. Yekini told journalists in Makurdi that police in Zaki Biam, Headquarters of Ukum Local Council Area of the state had on Sunday night sent a distress call to the troops. The theatre commandant said his men responded swiftly and killed three of them. He said: “Barely a day after I addressed journalists on the success the troops have recorded in the past six months, members of Gana group had invaded parts of Zaki Biam. He stressed that 145,000 displaced persons across Benue, Taraba and Nasarawa states have returned to their ancestral homes. Chairman, Gwer West local council, Francis Ayaga, confirmed the return of 33,000 of the 34,900 internally displaced persons, to their ancestral homes. Also, Chairman, Guma Local Council, Anthony Shawon, said the invading herdsmen operate from Nasarawa State, adding that no part of the area is currently under their occupation. The commander conducted journalists round to have a field assessment of the return of the IDPs to their ancestral homes in Logo and Guma council areas of the state.